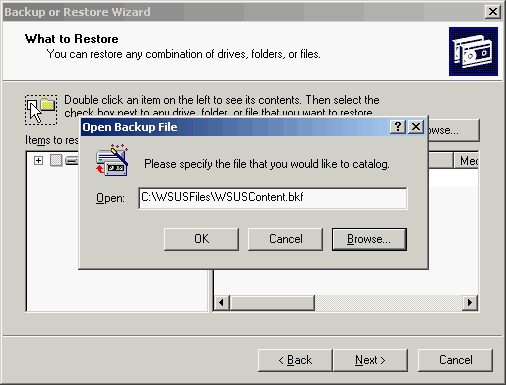 From the previous part, you have already exported the WSUS’s meta data and update files. 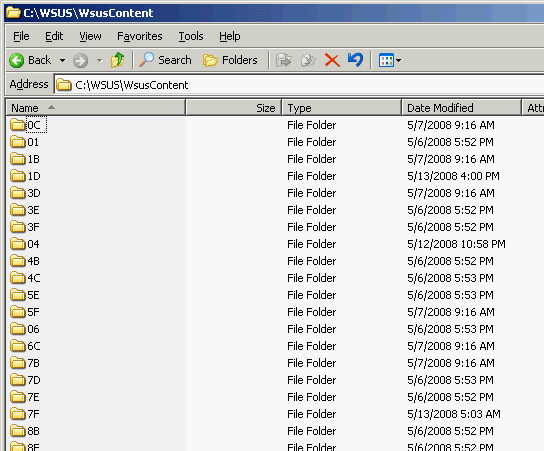 On this post, I’ll show how to import files and metadata to the disconnected WSUS server (the imported server). Copy files that you have exported from previous post to the disconnected WSUS server. 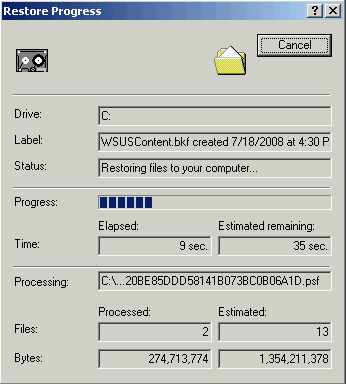 In this example, I copied from the exported server by using 8GB. 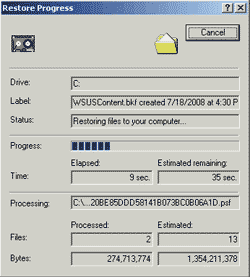 USB Drive to C:\WSUSFiles\. 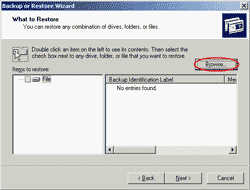 Note: If the files are too large to fit in USB Drive, you may consider using portable harddisk or tape disk. Open command-line and type ‘ntbackup’ to run the Backup/Restore tool. 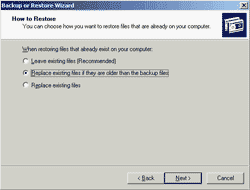 On Backup or Restore Wizard, click next. On Backup or Restore, select “Restore files and settings”. Click next. On What to Restore, click Browse. 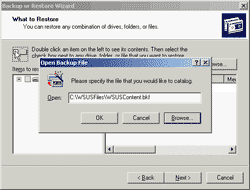 Then browse to the WSUSContent.bkf file (the backup file) and click OK.
Then, on right side, expand the list by clicking on the box until you can check the box. Click next. On Where to Restore, if you have different path from the backup file (D:\WSUS\WSUSContent), you can change it here by change “Restore files to” to “Alternate location” and browse to new path. In this example, the disconnected WSUS server has WSUSContent in C:\WSUS\ so I’ll restore on C:\. On How to Restore, leave default settings. Click next. On Advanced Restore Options, leave default settings again. Click next. 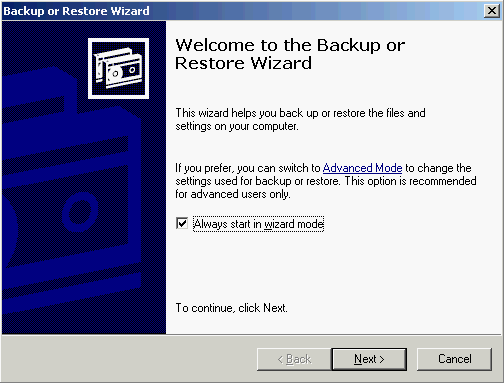 Waiting for the restoration process to finish. 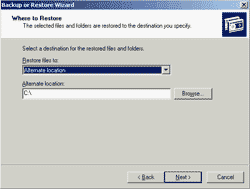 Note: The restore process may take time depends on update files. When restoration process finishes, click close. 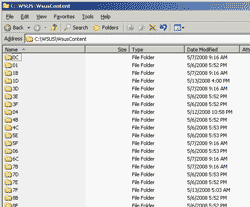 Try to view the WSUSContent folder, you should see lot of folders in WSUSContent. 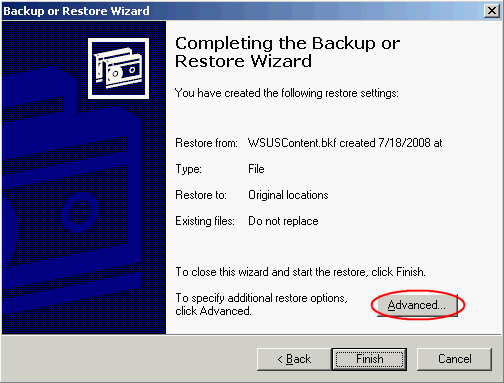 Now you have finished restore the update files on the disconnected WSUS server. 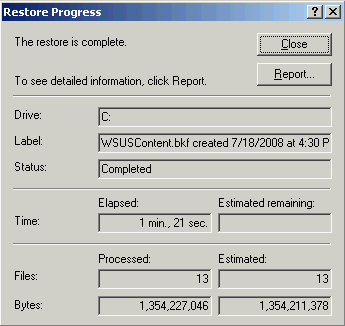 “C:\WSUSFiles\import.log” is the log file which will be created by the tool for logging the imported process. Note: The import metadata process may takes time depends on how large of the metadata. When the metadata file has been imported, open Microsoft Windows Server Update Services 3.0 SP1 -> click on Updates -> All Updates -> change Status to “Any” and click refresh. Now you’ll see the update list as you’ve just seen on the exported WSUS server. 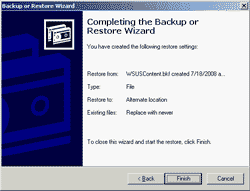 Then, you can distribute updates to any client as you want. 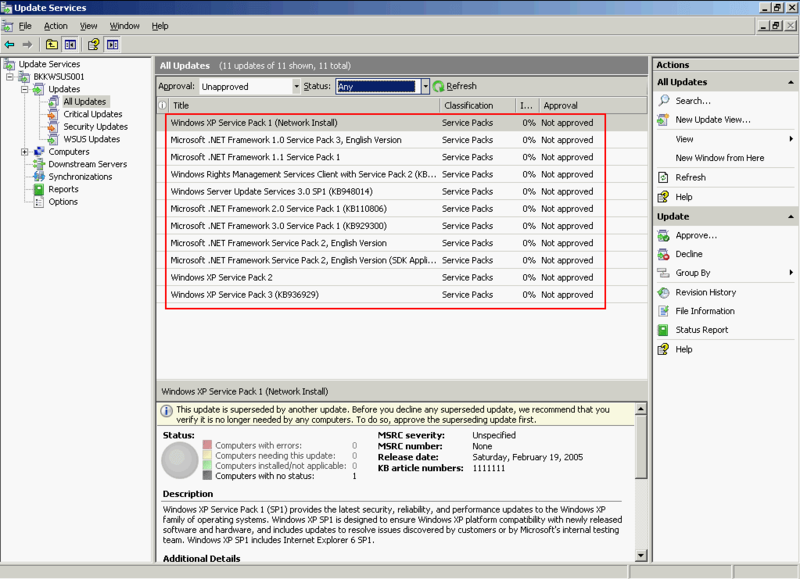 From all 7 parts of this tutorial, you should be able to manage WSUS server to distribute patches and updates to clients in the network. 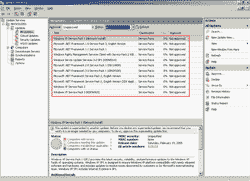 If you have a problem, you can discuss in the forum.